With the world of virtual reality being so new to the majority of developers in the industry, there's definitely a learning curve to figuring out what works, what doesn't and how a genuine sense of presence can best be leveraged in virtual space. Part of the process involves a deeper understanding of how the brain's visual cortex processes information, and another equally important component is player psychology. Emotions in VR can be magnified, to the point where some developers believe restraint is necessary in horror games, for example. Whatever the experience is, during these early days of VR, ultimately all developers need to proceed with caution, primarily because any given experience actually could be a consumer's first in VR. That's a rule that Ubisoft Red Storm Creative Director David Votypka takes to heart. "As game developers we have a responsibility to be considerate about the types of experiences that we're doing because it now feels that much more realistic and you feel that much more connected to it. But I think Ubisoft's philosophy overall is that we want to deliver positive experiences and we want to try to avoid any negative reactions or connotations players might get from VR," he told GamesIndustry.biz recently. "There was a presentation that Sony did a while ago, and they talked about when you build and design your game, you have to remember that the first thing the player sees, whether it's your main menu or whatever that experience is it may be their first time ever being in VR and every team working in VR has to be considerate of that." "Things like social cues really translate in VR and personal space can get uncomfortable just like in real life... There's lots of social psychology that we've discovered during this process so it's going to be interesting to see what happens"
Votypka believes that one of the first VR experiences that many people should try is social VR. 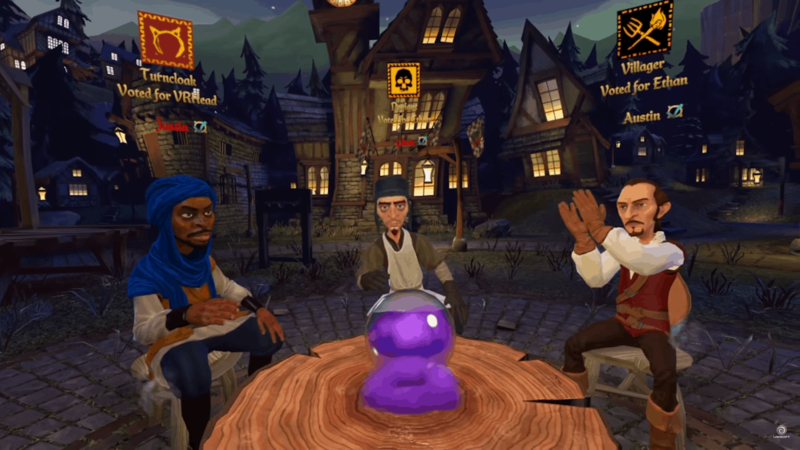 With the unveiling of Werewolves Within at GDC, he made it clear that social VR is the main focus his studio will pursue in VR. As we discussed with CastAR's Jeri Ellsworth, it's somewhat ironic that the social element is what many are now pursuing in VR when the technology is inherently a bit isolating, especially compared to augmented reality. "It's totally logical to think that about VR. I started thinking about VR in the mid '90s and worked in it and put a lot into it over the years and I really didn't think of the social aspects for the majority of that time, until a couple years ago when I saw a video of a speech from Michael Abrash at Carnegie Mellon. He talked about social VR and one of the things he said is he predicts VR will be the most social medium we've ever experienced basically," Votypka recalled. "I was like 'Wow, that's a pretty bold statement.' We had been working at Red Storm on other various social prototypes, non-VR versions, with our goal to bring players' social skills online. This was something we discussed with Ubi HQ and when we took one of those prototypes of players sitting around the table and we put it in VR in our first [Oculus Rift] DK2s and we networked the head position and the voice was there we immediately felt present, as if you were looking at another human being. It was this path of discovery that maybe there was something to this. Of course VR is isolating when you put it on your face in a room but when you're talking about a shared environment, that's when it becomes amazingly social. And as far as isolation, I think the Vive's chaperone system is awesome. That's a huge step forward for users." Aside from the 'round the table social deduction game, Werewolves Within, Votypka said that Red Storm is also working on an action-oriented VR game where social VR is still a "fundamental hook." Even with a limited amount of time spent in VR with Werewolves Within, we began to understand why Votypka has become such an ardent believer in social VR. When people look you in the eye or point at you, even in a virtual space, it does elicit an almost primal response. "Things like social cues really translate in VR and personal space can get uncomfortable just like in real life," Votypka noted. "We did fresh eyes testing with players that knew each other and groups of players that didn't and the results were surprisingly pretty similar. We won't know for sure until it's out in the wild... Also, you look at the game's art style and it's very lighthearted, and that helps people reduce their anxiety. There's lots of social psychology that we've discovered during this process so it's going to be interesting to see what happens." Votypka's been working on VR since the '90s when he had a stint at a then "cutting edge virtual reality company" called MUSE Technologies. While the headsets hitting the market now have their differences (and Red Storm will support all three), they're all leaps and bounds beyond what was being worked on 20 years ago. Votypka believes the current headsets all provide compelling VR experiences. "The lighthouse stations [for Vive] are a little different than the Rift sensors and the Move camera of course, but for us it's really about [whether they are] at that level where they can create that sense of presence with players and bring people's hands into the game and really start to convince the user that they're there in that world. And I think the answer for all three of them is yes, and that's exciting because in the '90s that wasn't the case. Achieving a sense of presence was pretty difficult," he said. Speaking of bringing hands into the game, Werewolves Within does not support movement-tracking controllers, but Votypka isn't against a possible patch to integrate those controls at a later date. "Some of the work we're doing at Red Storm does include hand tracking and Werewolves Within was actually designed to ship originally before the hand tracking controllers were available so we needed to support the gamepad, and on certain platforms the hand controllers are sold separately so you can't rely on all players having them," he explained. "So we filled in the gaps, where the game analyzes your voice - this was tech we had from our non-VR prototype days and we brought it in here. Whether or not we add hand tracking to Werewolves Within is still TBD but I think it works pretty well. Generally speaking, I'm a huge proponent of hand tracking and I think it needs to be there for most VR experiences. There are some that don't make sense, but when somebody gets into VR the first thing they do is try to look at their hands." Indeed, being able to use your hands in VR immediately adds to that sense of presence, as does locomotion in room-scale VR. Locomotion, however, presents another problem for VR designers. Given that most VR users only have limited walking space, many VR titles resort to "teleporting" in virtual space; that sudden teleportation, instead of actually moving to another spot, can detract from immersion. Are we all going to need special VR treadmills? "How many users are actually going to have the treadmills in their house? I think that could be really cool for VR arcades for example, where it's a destination to go to, and then the experience you play would be built around that treadmill," Votypka said. "Eventually, we might have smaller devices that can fit in a home whether it's a board you put your feet on and you're just leaning, or just rolling a ball - I've seen some prototypes where you can essentially sit at your desk and move your feet around and that gives you a sense of motion. "With the room scale and just walking around a few feet to explore it helps if the game is designed for that. If you're in a big open environment and you feel like 'why can't I just walk anywhere?' that'll be worse for the player than if, for example, you're in a small compartment like in a submarine game - the space is small enough that you don't feel artificially constrained. I think at the beginning the design choices will have to match the locomotion system, so it's not illogical for the player. Then as locomotion improves and players become more comfortable with it, then the design choices can open up after that." Werewolves Within is one of the easier games to stomach, quite literally, as you're sitting still. As soon as you introduce motion to VR, things can get iffy, especially for more sensitive types. "I think over the last two years there's been huge progress. It started with the hardware, the [Oculus] DK1, when you put it on just sitting in a room looking around it could make people feel queasy because of the latency and whatnot. So the hardware manufacturers made huge leaps and bounds in that area. The second part of it is clever design decisions and Eagle Flight is a good example. One of the things that can make you ill in VR is when there's something whizzing by you in your peripheral vision. So they're kind of putting blinders on you when they detect that, an object or wall you're flying by. A lot of things like that are still being discovered and figured out," Votypka described. "The vast majority of people who played Eagle Flight are really comfortable with it, which considering where we were two years ago that's a big step forward. Some people are more sensitive to it. The other factor is as devs if we're playing our games in VR everyday we become sort of immune to it for the most part. There's one or two guys here who that hasn't happened to but for the majority of the team, myself included, [motion sickness] has gone away. It'll be interesting to see how consumers adapt to it when they play over time." Unlike traditional console/PC gaming, which can often lure gamers into hours-long play sessions, VR may represent a new design challenge. Similar to mobile, shorter may be better. "We have various groups in Ubi doing play tests and research sessions with people they bring in off the street and have them playing our games. In general, we're trying to keep our session times to 15-20 minutes, instead of making it an hour long just to finish a mission. We'd rather have the short session times and if you want to play multiple sessions in a row, cool. But we don't require the player to play long sessions," Votypka said. "Year one of VR is not going to see huge, AAA budgets... as more headsets get out there, and as we're growing our capabilities the scopes of the games will get bigger and bigger"
While Votypka can't speak to Ubisoft's overall VR strategy, he couldn't be happier that the publisher is jumping on board the VR train this early, unlike its competitors. It's notable that Ubisoft has always been willing to take risks on new platforms and technologies, supporting products like the Wii, Kinect and Wii U at launch. "That's the one thing I love about Ubisoft is that they have the mindset to be there first. It's not always going to work out - sometimes you win, sometimes you lose, but being there first has so many potential advantages," Votypka enthused. "Having multiple studios in Ubisoft working on VR now, whether they're building and shipping games like we are, or whether they're prototyping [for] when VR takes off and I believe it will this time - I went through the '90s when it didn't - we'll be in a great position, we'll be in a leadership position and that's what Ubisoft wants to do. "I also appreciate that Ubisoft is willing to try a game like [Werewolves Within], because there's never really been anything like this in a video game format... For me personally I've just been so excited about the potential of VR since I was 19 years old so I want to build great experiences and I don't think anybody has seen something like this. Social VR is really pretty magical. It's like you feel like you're there with another person, even with just the Rift networking your head position and there's so much more we can do and next-gen VR is going to add facial expression tracking and that kind of the stuff, so this is just the tip of the iceberg." Votykpa isn't sharing budgets, but it's clear that Werewolves Within didn't cost anything close to the level of a typical AAA project - and that's likely true of Eagle Flight as well. So while Ubisoft is the first publisher taking a risk in VR, it's certainly not on a massive scale. But that's to be expected. "Year one of VR is not going to see huge, AAA budgets," Votypka acknowledged. "But I hope it'll see really strong innovation - and I think this game is one of those - and get people's attention. It's kind of the chicken and the egg - people are concerned about the VR headsets' price, so they want to make sure there's good content, but certain publishers are waiting to see if people buy the headsets. And they're not putting content out there [for VR], so we want to do our part to make sure there's great content. And as more headsets get out there, and as we're growing our capabilities the scopes of the games will get bigger and bigger." All the high aspirations of a shared meta-verse, with open VR SDK’s and shared research on the best way to exploit this emerging technology – all towards ensuring that bad VR did not ‘muddy the water’, seems to have fallen flat at this point. A mad scramble to acquire investment, dominate the sector, and build a ‘walled garden’ to control circulation and information has revealed a seamer side to the high ideals originally trumpeted for the re-emergence of this latest phase in VR. While some may feel that a ‘Barf-o-Meter’ is the best that internal research can provide to help shape players expectations of what is good and bad in VR, others aspire to loftier goals. Let’s hope that corporate greed does not get in the way of VR adoption… for a second time!